SaaS companies are growing rapidly due to customer demand for cloud-based solutions. For public SaaS companies, the median growth is 28% while the median loss is 4.5% (Software Equity Group). A survey of private SaaS companies by Pacific Crest Securities reported a median 36% revenue growth. The paradox of the SaaS business model is that fast growing SaaS companies usually lose money, but have high valuations. When growth slows, profits increase, but the valuation ratios drops. The fundamental characteristic of a SaaS business is the faster you grow, the more you spend today for revenue that comes later. Profits (or lack there of) are a poor proxy for the long-term value of fast growing SaaS companies; but just because a SaaS company is growing rapidly and losing money doesn’t mean we can’t assess their performance. This article analyzes each of the metrics and their impact on the SaaS business. In the rapidly growing SaaS markets, growth is demanded to establish a market leadership position. Revenue growth is a primary indicator of the success of a SaaS company demonstrated by the market acceptance and the ability to monetize growth. Tomasz Tunguz of Redpoint Ventures, in his post, The Best Way to Benchmark a SaaS Startup, reported that public SaaS companies had an AVGR of nearly 100% in their fifth year since founding declining to a healthy 40% after ten years. With few exceptions, revenue growth is the number one measure of success. When analyzing a SaaS company, the non-recurring revenue should be eliminated from the growth assessment. The most accurate measure of future revenue growth is to measure the growth in CARR (Committed Annual Recurring Revenue) from the end of one accounting period to the end of the next period to eliminate revenue timing issues of when revenue is recognized. 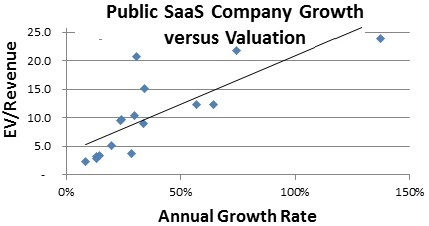 Revenue growth is the second greatest predictor of the price revenue valuation of public SaaS companies with a 79% correlation between growth and company valuation ratios (Economic Value/Revenue). The successful SaaS ISV will drill down on the source of revenue and optimize each component of growth – Maximizing Revenue for SaaS Companies is more than Customer Acquisition. Revenue growth comes from sales to new customers, new customer revenue, upsells and cross-sells to existing customers, expansion revenue, and is reduced by churn. As the company’s user base increases, a larger percentage of the revenue will come from Expansion revenue. 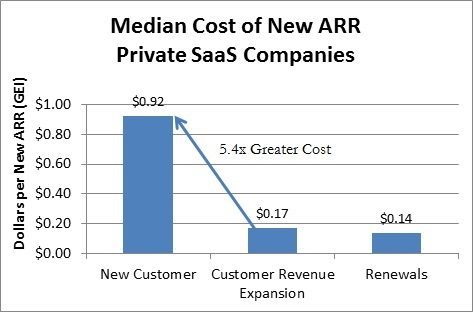 A criticism of the SaaS business model is the continued loses of high growth SaaS companies due to the up-front revenue acquisition costs that are not immediately offset by the SaaS subscription profits — a new SaaS customer is a money loser for the first year or more and later that customer’s profits start rolling in. While the delay in profitability is readily explained conceptually, there needs to be a method to determine the core profitability of the SaaS business. The SaaS business must ultimately become profitable once growth slows. The core economic of a SaaS business is revealed by separating the cost of growth from the steady-state business – each part of the business should be assessed separately. When the cost of net growth is deducted from the Recurring Profits, the amount is equal to the GAAP of IFRS profits. The Recurring Profit Margin is the Recurring Profits divided by Revenue. By excluding the cost of growth, the underlying profitability of the SaaS business can be determined. For the company to be viable, it needs to generate profits after the hyper-growth phase. SaaS companies should grow their Recurring Profits Margins to a minimum of 10% to 20% once they have critical mass. Companies with lower Recurring Profits may not have a sustainable business. 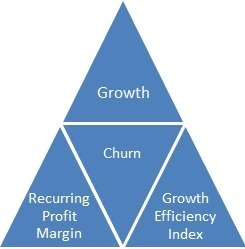 A SaaS company that grows and has strong underlying profits still must grow efficiently. The Growth Efficiency Index is the cost to add a dollar of new Commited Annual Recurring Revenue (CARR) including revenue to replace churn. The Cost of New Revenue consists of all Sales and Marketing costs, including the cost of onboarding that is not paid by the customer, cost of Customer Success and Account Management, and the cost of free trials. GEI values of less than 1.0 are widely viewed as efficient revenue acquisition while a GEI of over 1.0 is sub-optimal. The higher the churn, the lower the acceptable GEI since the value of a customer that is likely to churn is less. GEI values of less than 1.0 are widely viewed as efficient revenue acquisition while a GEI of over 1.0 is sub-optimal. The amount a company should spend on acquiring new revenue should be controlled by the lifetime value of that customer — their Customer Lifetime Value (CLV) which is a function of churn. The Customer Lifetime Value (CLV) of a SaaS customer is equivalent to the Gross Profits from a product sale as it is the present value of the SaaS subscription gross profits. The effect of churn on the Customer Lifetime Value is dramatic because the higher the churn, the less time a customer will be generating revenue increasing their CLV. The ratio of the cost of acquiring a customer should be less than 25% of the Customer Lifetime Value. This formula yields a Revenue Acquisition Cost (Sales & Marketing) of less than 25% of the customer Lifetime Value which is comparable to the median Sales & Marketing costs of public software of 23%. The SaaS “Land and Expand” strategy is to seed customers with a small SaaS offering and expand that offering with the customer’s success. Initial Revenue Acquisition Costs are expensive (high GEI), but the expansion revenue is much less costly. As SaaS companies’ customer bases expand, a greater portion of the revenue should be derived from customer expansion reducing the GEI. It is important to follow the trends in GEI. GEI should improve (decrease) as new revenue increasingly comes from lower cost Expansion Revenue discussed above. Churn impacts each of the three primary metrics dramatically. Revenue growth is difficult with large churn to replace. The cost to replace churn impacts the core profitability – the Recurring Profit Margin. The Sales & Marketing costs to replace that churn reduce the Recurring Profits. 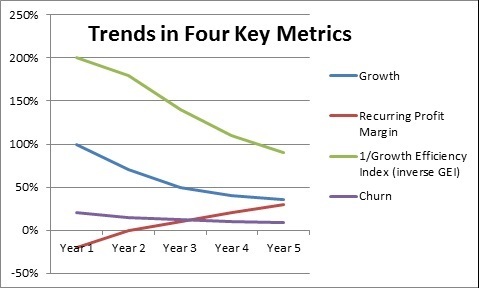 Churn impacts the Growth Efficiency Index. When customers churn the opportunity is lost for lower cost expansion revenue. 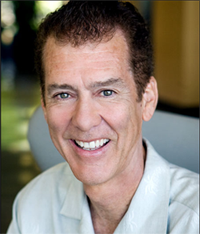 1) Growth is valued, because it presumes this growth is building a recurring revenue stream. 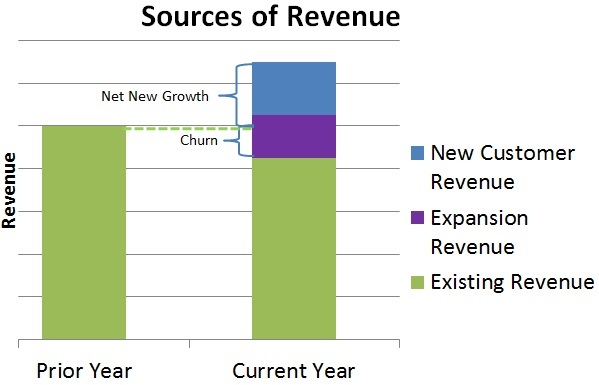 Churn decreases the value of the future revenue stream. 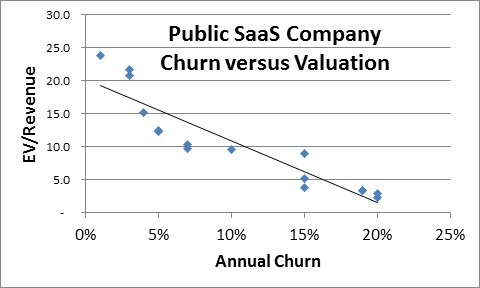 2) Churn indicates dissatisfaction with the SaaS offering. Customer dissatisfaction will ultimately impact the company’s growth. 3) High churn relatively to peer companies implies poor management. When a new SaaS offering is launched, it is anticipated that early growth (from a small base) will be high, Revenue Acquisition Costs will be high as early customers are expensive to obtain, and Recurring Profits will be low until the economies of scale are reached. In assessing a SaaS company using these four metrics, both the stage of the company and the directional trends in the metrics must be considered. 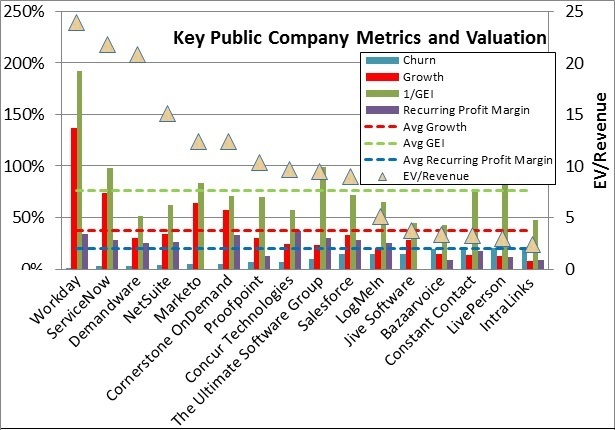 These public companies demonstrate how the market values their key attributes shown by the SaaS metrics. Companies like Workday with high growth, low churn, and good Recurring Profits are highly valued. Companies with lower growth and higher churn as much less highly valued. Running a successful SaaS company is difficult. Assessing its current success isn’t as difficult. Comparing the revenue growth, core profitability, and cost of revenue acquisition can tell you a most of what you need to assess the company’s current position. Yet its hard to achieve world-class results in these three metrics alone without having low churn. Churn provides a leading indicator of future success, which is likely why it correlates highest with company valuation ratio. These key metrics should be assessed with regards to the stage of the company. In the early stages of company’s growth, operational efficiencies have not yet been reached, and early sales are expensive. If the trends are favorable, the early stage SaaS company can transition into having a more successful profile with these key metrics.